We loved this book! It was fantastic that Giselle takes you on a trip around the world one animal at a time. We had so much fun taking turns doing the different poses. It wound up being a fun activity to do before bed, and something a little different from just reading a book like we usually do. Emily's interpretation of the turtle pose. I have been curious about us trying yoga together for awhile, so this was the perfect option to introduce it in a child friendly way. The illustrations were well done and clear for us both to see what the poses were and what animals were represented. It seemed to work out any extra energy that she we had. As a parent, I appreciated that there was a list of the kids yoga poses after the story. There was also a lot of great tips for getting the most out of our yoga experience. I can see this becoming a regular routine for us. I received a copy of the book to conduct my review. Opinions are 100% my own. Hahaha! Like we parents ever have "extra energy"!! Glad you enjoyed the book Sarah and I hope it continues to have a calming influence. ;-) Thanks so much for taking part in the Good Night Animal World Blog Tour. Sarah - Thank you so much for your fabulous review of Good Night, Animal World! 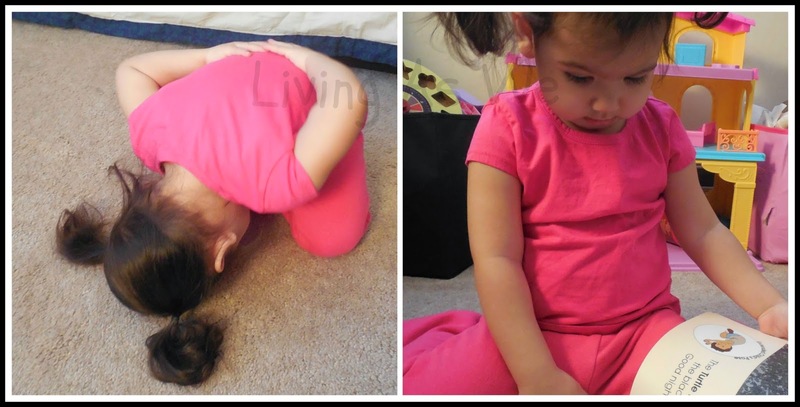 The picture of your daughter in Turtle Pose is absolutely precious. Looks like she's a natural yogini. I agree, both children and adults benefit from the yoga poses before bedtime. I'm like you too - I enjoy reading and acting out the book as much as my daughter! I hope this book sparks a continued momma-daughter yoga practice. So great. Really appreciate you joining our book tour. Your review has made my day!